Our Argentine pizza obsession began long before arriving in Buenos Aires, thanks to our friends Juergen and Mike’s excellently thorough book For 91 Days in Buenos Aires, in which they shared their own pizza obsession restaurant by restaurant. Now, Jess is from Chicago, and I’ve been eating pizzas on my over 12 travels through Italy for over a decade, so between the two of us, there is no meal we enjoy sitting down to more than pizza. Using the book as a start, I then began researching even more pizza places in the city, and my list got longer and longer before we even landed. Even though my plan conflicted with the healthy eating regime Jess has us on, I was determined to try them all. One by one we crossed every single pizza joint off my list and stopped into random pizza restaurants as well (we also ate lots of salad, I swear). We quickly learned one lesson about pizza in this city of Italian immigrants: even though there is a pizza place on every corner, the quality varies dramatically, from heavenly to forgettable and from mediocre to downright disgusting. Although you might not be as obsessed as we are about pizza, we don’t just want you to sit down at a red-checkered table cloth and hope for the best. In the name of research, we were more than happy to sample over 15 different well-known pizza places in six weeks in order to develop our expert opinion on this to bring the following pizza recommendations to you! Somewhere between Italian and Chicago deep dish, Argentine pizza is thick, very cheesy and usually light on the sauce. Rather than being baked with the cheese, toppings are piled high on top just before being served and this freshness nicely balances the thick, gooey layer of cheese. Coincidentally a five minute walk from our apartment, El Cuartito was our first stop on our pizza pilgrimage. This Buenos Aires institution was high on our list after reading about it in this For 91 Days article. Established in 1934, El Cuartito still has all its old-fashioned charm, its walls plastered in sports posters and football on TV. Even though there is almost always a line out the door during main dinner hours, we rarely saw any other tourists here (and yes, we ate here more than once…or twice…). 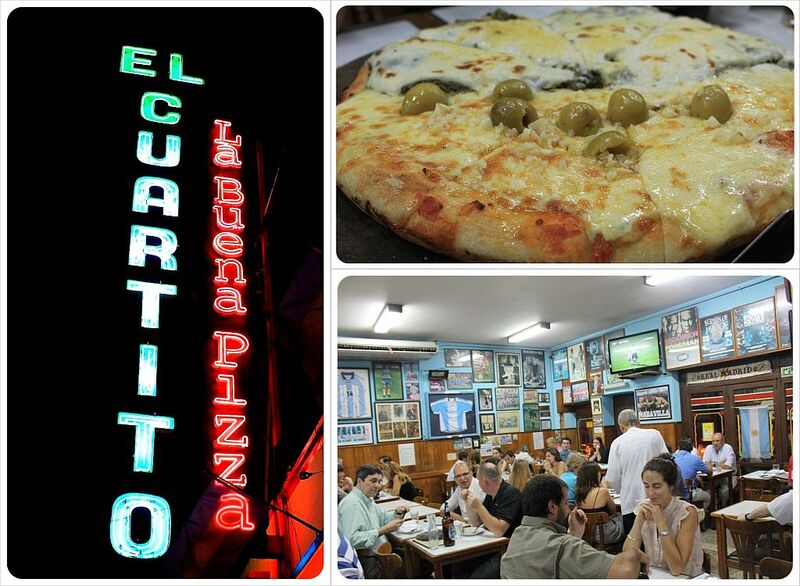 Our recommendation: The Napolitana was our favorite type of Argentine pizza overall, and El Cuartito does it best. 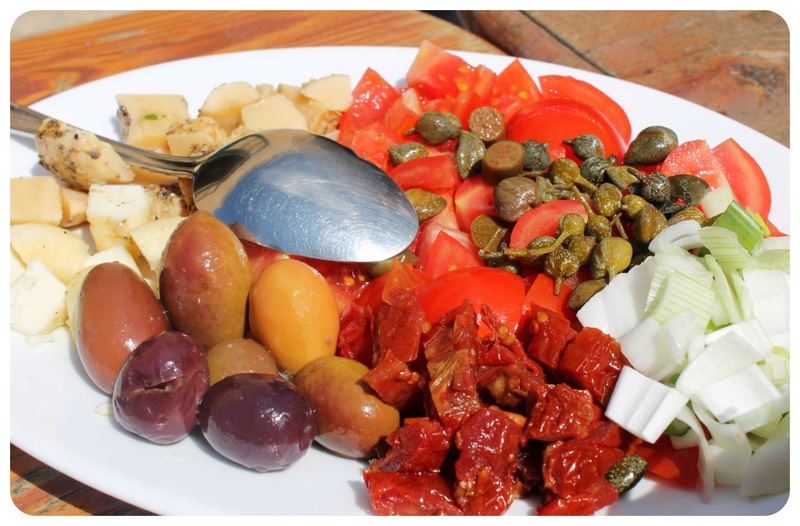 A Napolitana has mozzarella cheese – called muzza in Argentina, thickly sliced fresh tomato slices and whole, pitted olives strewn generously on top. For Jess, Los Inmortales is at an exact tie with El Cuartito, so it is only just slightly a runner up in the Argentine pizza category. A chain with five branches in Buenos Aires, Los Inmortales pizzas come with loads of vegetables on top and have less cheese than El Cuartito (though only slightly!). We ate at both their Recoleta branch and the one across from the legendary El Güerrín (mentioned below). One great thing about pizza in Buenos Aires is that you can always split toppings half and half, paying the full price for the more expensive of the two. At Los Inmortales we split the Napolitana with one topped with hardboiled egg (see the interesting picture below), and one split with half covered in fresh Rucola and the other topped with loads of freshly chopped basil. The best thing about Los Inmortales is the quality of the dough. We noticed this right away with the basket of bread that comes before the meal, in the pizza crust itself, but the dough was able to shine the most in the empanadas. Even though we were ridiculously full, we still managed to fit in a Caprese and a Roquefort empanada, both of which were easily some of the best we had in the city. El Güerrín is another Buenos Aires institution and was packed every time we went there. The eggs on our spinach and egg pizza were undercooked, but the Napolitana more than made up for it. Most pizza places in Buenos Aires have sections where people just grab a slice or two and eat them standing up, and El Güerrín was definitely one of the most popular places to do that. This is faster, easier and cheaper, since you don’t pay service charges, so we returned to give the place another chance. 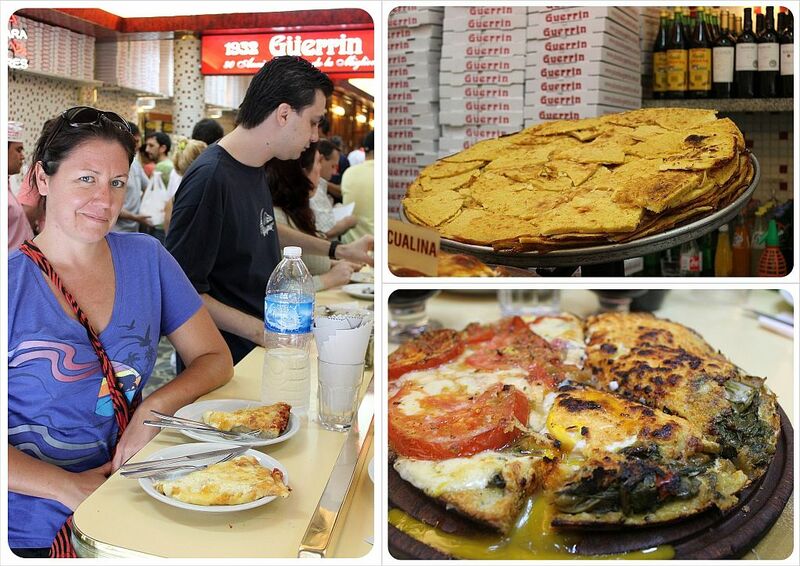 We grabbed a few slices and as well as an order of faina, which is very good at El Güerrín. Shaped like a slice of pizza but thinner, Faina (pictured below) is made of a chickpea batter and meant to be placed right on top of your pizza slice, essentially creating a pizza sandwich. 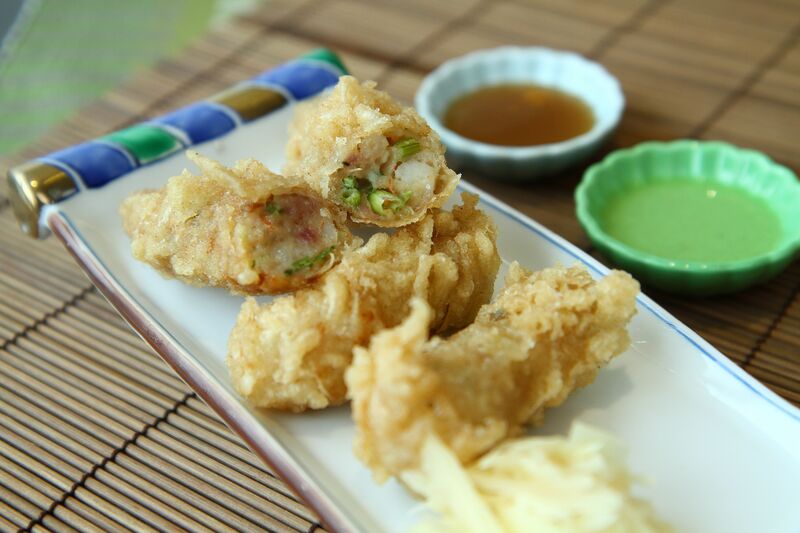 Even though faina apparently originated in Italy, we have never seen it there. After trying Faina a few times, we concluded that while it tastes good, it doesn’t add to the pizza experience and takes up room meant for more pizza in your belly! Although Argentines have developed their own very unique style of pizza over the years, the thin crust Italian style pizza is still found here often. 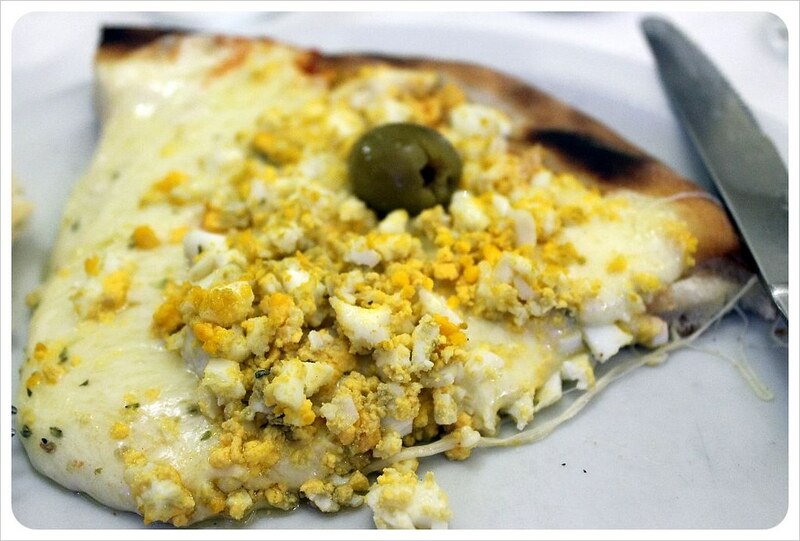 Filo, located in the Microcentro business district, was our absolute favorite pizza place in Buenos Aires. Even though indulging in cheesy Argentina pizzas and empanadas is a treat, we both prefer Italian-style thin-crust pizza and Filo’s stone over pizzas were seriously addictive. Their fresh rucola and shaved parmesan pizza was by far the best pizza we had in the city. Although the service here is seriously lacking, the stylish restaurant also adds to the overall experience, with big red American diner style booths in the back, an rather interesting mannequin at the entrance and a live DJ (quietly) spinning electro house all night long. The prices here are higher than the local Argentine spots, with an average meal for two, with one alcohol beverage each (because they don’t come back to serve you after your pizza comes) ran us $30-$35 on our visits here. 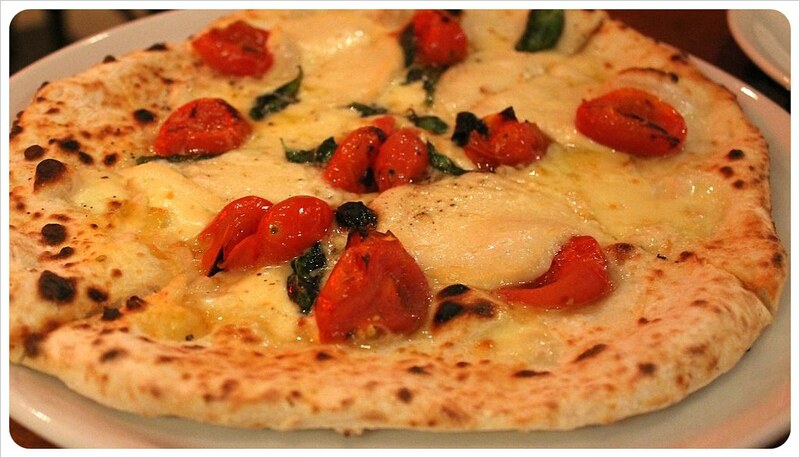 Siamo nel Forno in Palermo Hollywood is often mentioned as a premier spot for Italian style pizza. The intimate restaurant is set in the chic Palermo neighborhood and its prices are accordingly high. Their ‘pizza of the day’ was a shocking AR$90 (U.S. $18) but the high quality ingredients, rich homemade sauce and light, crispy dough are well worth the splurge. Two pizzas plus drinks would have made our total bill roughly $50. The Argentine style pizza at this affordable pizza joint was delicious (we had our standard, go-to Napolitana here), but no matter what you order you must save room for dessert – because Bakano makes dessert pizzas. The idea is as simple as it is genius. They take the pizza dough and create sweet pizzas like dulce de leche topped wtih vailla ice cream, or Nutella pizza topped with ice cream, or brownie banana chocolate pizza, or one with fruit and cream and so on and so on. Uh.mazing. There are three branches in Buenos Aires. Though it might sound questionable considering there is a distinct lack of Italian influence in the state of the same name, Kentucky Pizza has become a bit of an institution in Buenos Aires, albeit of a cheap, post-party nature. This chain can be found throughout Buenos Aires, with most branches in and around Palermo. It is not the best pizza we had, but it is by far the best value for the quality. You can order full pizzas or eat by the slice, and Kentucky Pizza has great slice + drink meals, which includes beer or wine as an option. After having read about the sizes of their wine glasses I ordered the deal that included two slices of pizza and a glass of wine for AR$23 (US$4.70), and left happily fully and a little bit tipsy! Although the empanadas also looked great at Kentucky, we filled up on pizza and faina both times and never got around to trying them. 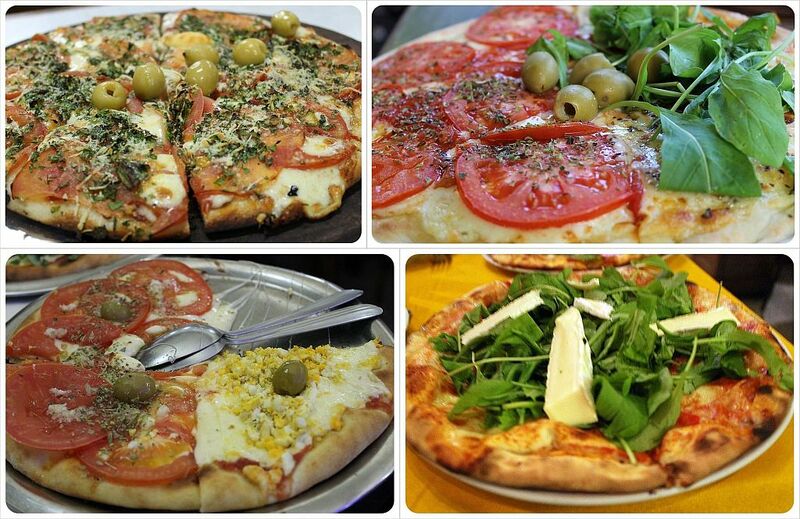 Now that you know where to find the best and most delicious pizza in Buenos Aires it’s time to think about where you’ll be staying on your visit to Argentina. 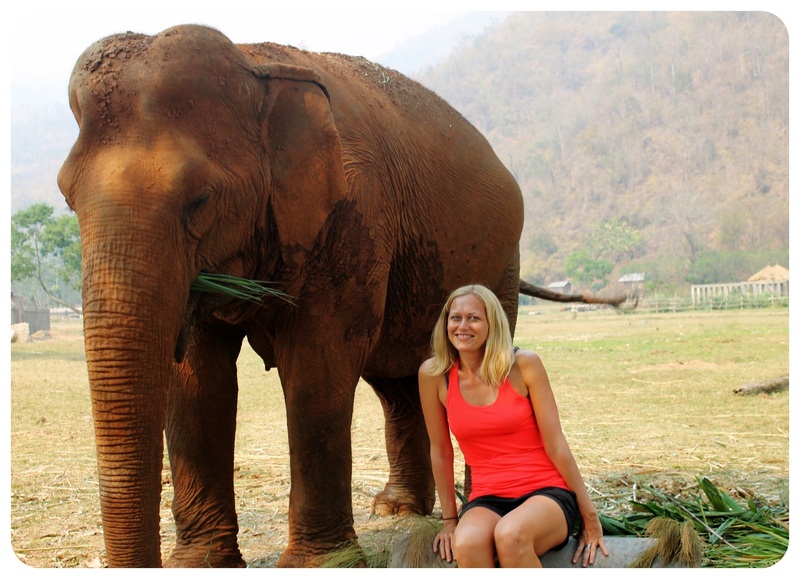 Expedia is a great site to start, as it has access to many affordable hotels. It’s advised to book travel accommodation in advance, that way you have less to worry about once you land. You can find Kentucky Pizza on Facebook. Let’s keep this important pizza post alive! 🙂 Please add your favorite Buenos Aires pizza places in the comments! From one American to another, I think this topic of pizza brings us closer together even though we’ve never met. I just returned from a year in China, and one thing I can bring back from there is that the Chinese have no idea how to make an edible pizza! I’ve never been to Buenos Aires, but I’ll be sure to keep this post bookmarked for my eventual arrival there. I just ate my lunch and suddenly I feel empty again!! If I was in BA i’d be off to one of these places right away!!!! If I ever find myself there I hope I remember to come back to this post. I hope you’ll find yourself in BA one day, Forest – not only for the pizza 😉 It’s actually a really great city! 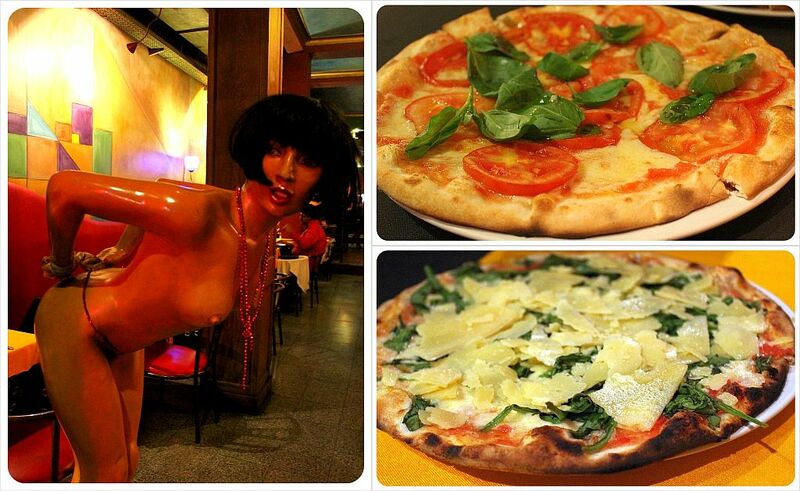 Our fav was in Palermo Hollywood – little hole in the wall joint…wish I could remember the name now!! I can’t believe we didn’t try the dessert Pizza at Bakano … we loved the terrace there! Great for people watching. 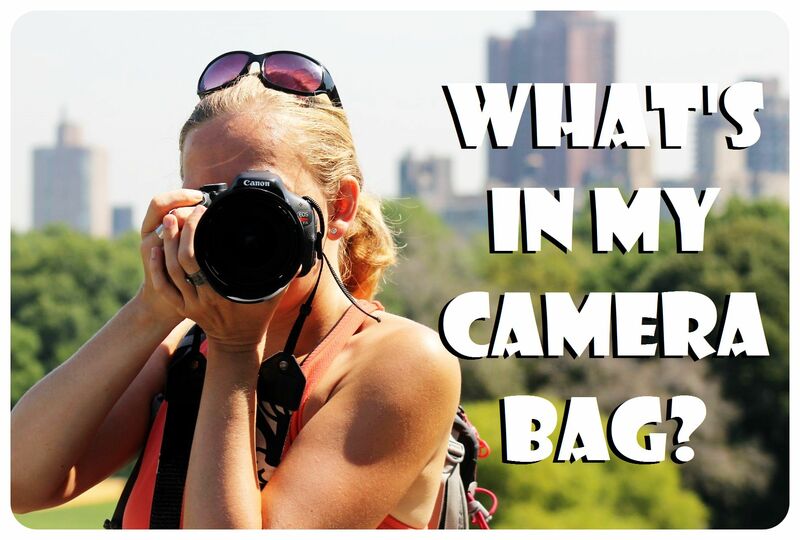 Love the post … makes me want to go back to BA just for the pizza!! You know we are just as pizza obsessed as you but despite trying many different pizzas in BA we just didn’t find any we really loved. They were all too cheesy and salty for us. We were rather disappointed considering our high hopes given the Italian influence. Those pizzas look like a heart attack waiting to happen. Which means I’m sure they tasted good! LOL, that’s a good way to describe our pizza feasts 😉 The possibility of heart attacks was definitely there at times 😉 But the pizzas were just soooo good! 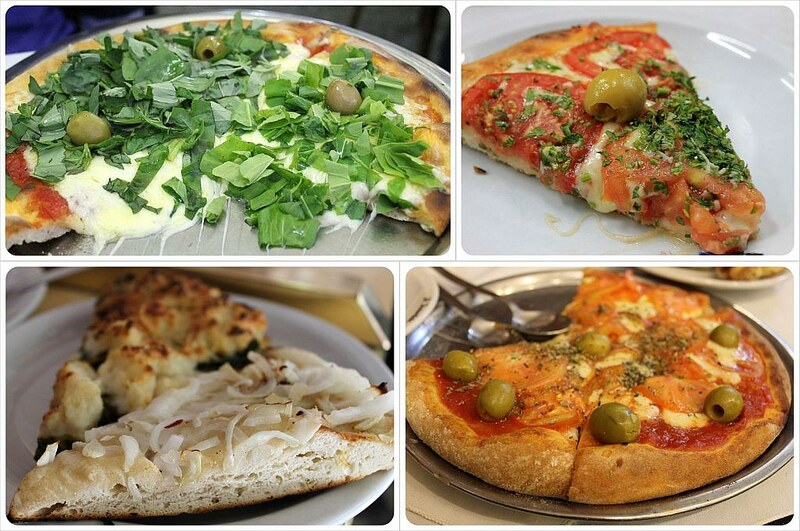 I don’t think I had any pizza when I went to Buenos Aires… I guess another reason to go back! Have you ever eaten pizza in Peru? I loved the pizza in Cusco, especially the spicy-tangy sauce they gave me to put on top of the pizza. Interesting post. I tried my hardest to like pizza in Argentina, but never found a single place in BA, Cordoba, or Mendoza that I liked. Well, there was one place in Mendoza where it was edible. I am a traditionalist, with a love affair for Italian pizza, but also grew up outside of NYC, so I have high standards. The Italian style pizzas you showed looked pretty decent, but I was not a fan of that thick “crust”, gooey cheese, and olives. 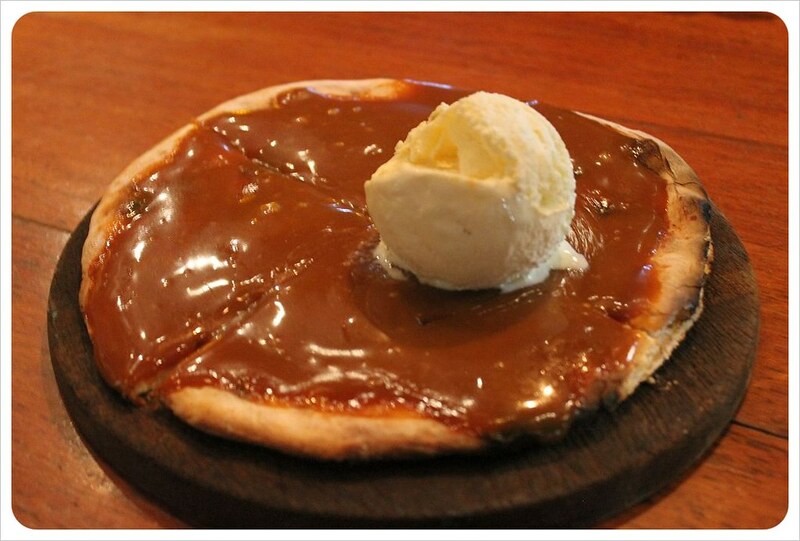 I would, however, love to track down one of those dolce de leche dessert pizzas – that looked tasty! My mouth is watering, and the quiche I had planned for dinner no longer sounds appetizing. Dessert pizza…I think you just made a woman out of me! Thanks for such a great listing. I’d love to see favorites from your Italian travels, especially any from Naples!